Who is Bruce Ohr, and why is Donald Trump saying nasty things about him? Who is @aliasvaughn? There are at least two views, one very flattering, one less so, and others. For my mileage, I’ve come to regard the handle on Twitter as a gossip columnist on the Trump administration troubles with criminal law. That’s not to dismiss the work at all. Jack Anderson took over a Washington gossip column, and became an investigative powerhouse during the Watergate years. We could use another Jack Anderson now, to present what is known about scandals in the White House, with assured publication in 1,000 local newspapers that right now get almost none of that news. Plus, as anyone who heard me talk to corporations, an organization’s gossip reveals information vacuums that great leaders will fill with good, accurate information, and often reveals details about events that do not appear in the official versions of a story, but which can make all the difference in the world in properly dealing with a situation. Leaders listen to gossip, and answer it. In any case, today Ale (@aliasvaughn) offers a lengthy-for-Twitter explanation of why Donald Trump lashes out at Bruce Ohr, who you and I don’t know from Adam nor Adam’s off-ox. The explanation has a lot of hyperbole in it — but it also offers information you can’t get from the Trump echo chambers, and a lot of connections today’s newspaper doesn’t have time to explain. Former Associate Deputy Attorney General and past champion Russian organized crime fighter Bruce Ohr. So I saved the thread here, and offer it for your edification and entertainment, and to convince you to go vote the bums out in November. 2. These details pertain to a breakfast that happened on July 30, 2016. Ohr described the breakfast to CONGRESS this week in a private interview. And that's how the GOP Trump lackeys went to tell Trump, he found out and decided he can't have a witness at DoJ. 4. An unnamed former Ru intelligence official said that Russian intelligence believed "they had Trump over a barrel", that's the quote that was reported. Steele and Ohr have known each other for over a decade. They shared interest in international organized crime. 6. Attacking them publicly is meant to discredit them as witnesses. It doesn't matter that it won't work as they will testify against him anyway, it's witness tampering at a minimum. This influences public perception, on top of the previous point I made about obstruction. 10. Ohr told Congress he couldn't vouch for the accuracy of Steele's information (bc duh, he wasn't there) BUT said he considers him a reliable FBI informant who delivered "credible and actionable intelligence, including his probe into corruption at FIFA". 12. All of the above literally DESTROYS Trump and the Trump lackey wagon conspiracy theory about the FBI being biased, or the Steele dossier being the reason why the Russia investigation started. And THIS is why Trump detests Ohr and knows he's his sworn enemy. 14. AP truth: " If the FBI’s investigations turn toward Trump’s ties to Russian organized crime, which is entirely foreseeable, Trump may be interested in trying to delegitimize those efforts as he has attempted with other aspects of special counsel Robert Mueller’s probe." 18. AP correctly notes: "little attention was paid to what may well be the most interesting item on Page's resume — her considerable experience prosecuting money laundering cases involving Russian organized crime." Page worked with FBI task force in Budapest vs? DMITRY FIRTASH. 20. This excellent AP story goes on asking an essential question: "Why does Trump risk so much politically by even threatening to pull the security clearances of an active DoJ official without any of the ordinary procedures for doing so?" 22. The above from the AP is the best succinct explanation you'll find for how Russian mafia operates and WHY Trump is frantic to keep his ties to Mogilevich hidden. Bc once they surface, they're like direct ties to PUTIN, so the jig is up. That's why he went after Ohr AND Page. 24. Trump of course (like other criminals) doesn't count on the fact that we figure out the puzzle MUCH faster than he can imagine, and he didn't count on the fact his ties to Mogilevich and Firtash would become obvious via MANAFORT as well. He's got CRS, Cornered Rat Syndrome. 26. Manafort can't even think of lying, bc he'll go to jail, and he can't even think of NOT giving the interview, bc he can be held in contempt and put in jail until he complies with the request. So, there's no pardon coming. 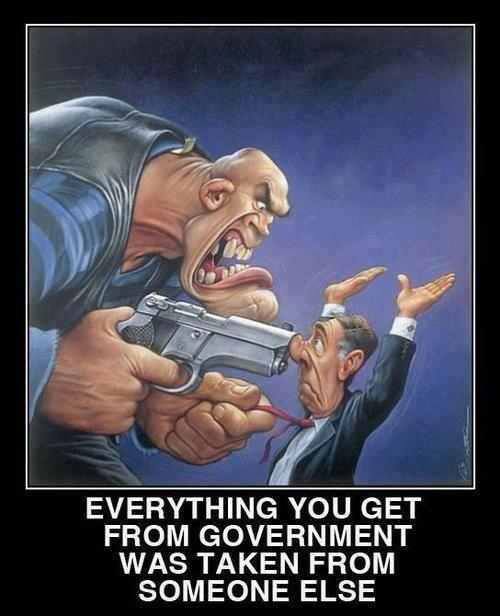 Not to mention: there are STATE CRIMES awating. 28. So watch the Manafort trial VERY closely. Watch what happens there. Because this trial? Merely the beginning. Manafort WILL be indicted for NatSec crimes as well. And he holds the financial key to them, bc he's the one who dealt with oligarchs and Firtash. 30. So this is also why Mueller's move to give the Cohen case to SDNY was GENIUS. Bc now BOTH him AND SDNY have a direct avenue to get to Firtash, and thus money laundering for Trump, with direct connection to Manafort., and thus conspiracy. Rest assured: #MuellerIsComing /END. 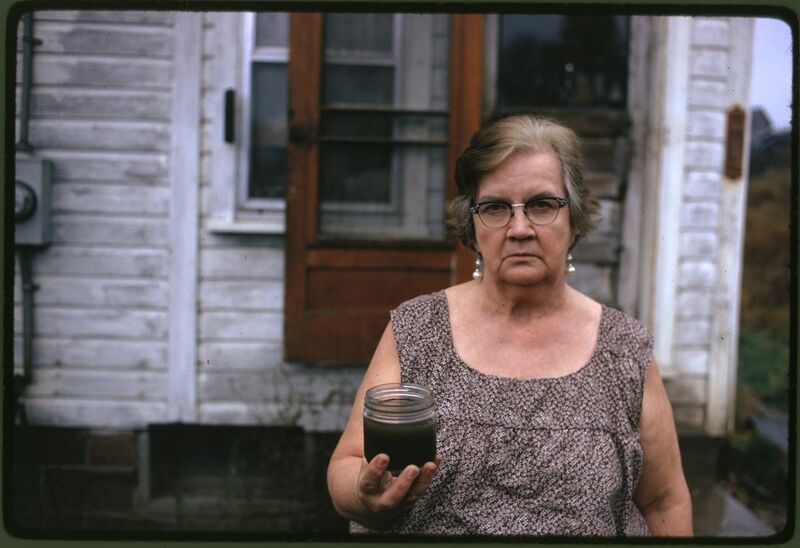 Verge caption: A woman holds a jar of undrinkable water from her well in Ohio in 1973. She filed a damage suit against the Hanna Coal Company, which owned the land around her house. 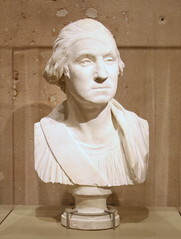 Photo by Erik Calonius / US National Archives. From EPA’s Documerica project. It’s good to be reminded of the burning Cuyahoga River, from time to time. As a great example of EPA’s successes, the the Cuyahoga has not caught fire for many years. In an era when our president and Congress appear unable to deal with one issue on a good day, it may be instructive to look back to a day upon which one U.S. President handled a lot, all at once. On August 4, 1964, President Johnson awoke to the news that two U.S. Navy ships cruising in the Tonkin Gulf had been fired upon by North Vietnamese Navy gunboats; then the FBI called and announced that the bodies of three civil rights workers had been found, young men registering African Americans to vote in Mississippi. Both of these events rumble through history like a Rocky Mountain avalanche to today; either was a make-or-break event for any presidency. Lyndon Johnson dealt with them both, the same day. And though Vietnam did not turn out for the best, it’s useful to note that Johnson’s call for Congress to grant authority to act on the Tonkin incident got results just three days later. Sadly we note that Stephen Stucky, the composer of this great piece, died of brain cancer on February 14, 2016. “August 4, 1964,” is an oratorio covering a remarkable and fantastic coincidence in the presidency of Lyndon B. Johnson. On that day, the bodies of three civil rights workers who had been missing for nearly seven weeks, were found in shallow graves near Philadelphia, Mississippi — they were the victims of violence aimed at stopping blacks from voting. The incident was a chief spur to the 1965 Voting Rights Act. And also on that day, the U.S.S. Maddox reported it had been attacked by gunboats of the North Vietnamese Navy, in the Gulf of Tonkin. The Gulf of Tonkin incident led to the Gulf of Tonkin Resolution, which gave Johnson the authority to expand and escalate the war in Vietnam, which he did. 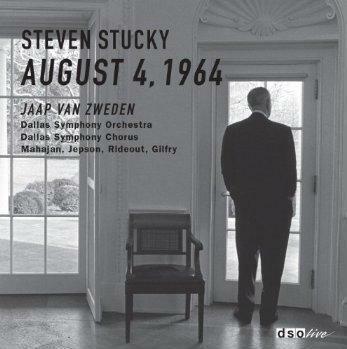 Cover for the CD of the Dallas Symphony’s Grammy-nominated performance of Steven Stucky’s “August 4, 1964,” Jaap van Zweden conducting. The Dallas Symphony commissioned the work, from composer Steven Stucky and librettist Gene Scheer, in commemoration of President Johnson’s 100th birth anniversary — he would have been 100 on August 27, 2008. The works were premiered in Dallas in 2008. Mr. van Zweden, hailed in his debut as music director a week before, scored another triumph here. And the orchestra’s assured and gritty performance was rivaled by that of the large Dallas Symphony Chorus, both corporately and individually, in shifting solo snippets charting the course of the fateful day. The strong cast, mildly amplified, was robustly led by the Johnson of Robert Orth, last heard as another president in John Adams’s “Nixon in China” in Denver in June. Laquita Mitchell and Kelley O’Conner, wearing period hats, were touching as Mrs. Chaney and Mrs. Goodman. Understandably, the taxing role of a high-strung McNamara took a small toll on the tenor of Vale Rideout in his late aria. The entire thing deserves more commentary, perhaps soon. There is stellar history in the choral piece. And there is this: Consider that Lyndon Johnson, the best legislator and second most-effective executive we ever had as president, got hit with these two crises the same day. On the one hand the nation got the Voting Rights Act, the Fair Housing Act, executive orders and government support to end segregation and the evils it created. On the other hand, we got stuck with the disaster of the Vietnam War. How would the nation fared had a lesser person been in the White House on that day? Teachers, can you use this music in history classes, on the Johnson administration, on Vietnam or Civil Rights? Kansas voters are angry; they elected Sam Brownback governor on his promises that slashing state budgets and slashing taxes for the wealthy would make Kansas prosperous. Now the roads are bad, schools are suffering, and many other state services can’t be done. Kansas is crumbling, and the state government is too broke to do anything about it. Kansas Gov. 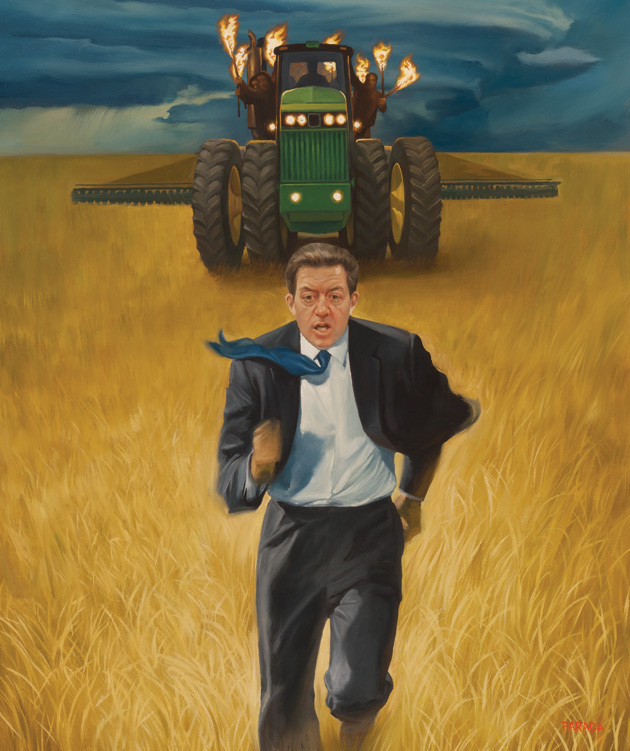 Sam Brownback meets with Kansas farmers about why the roads to get their crops to market are so bad, breaking their trucks and costing them time and money. Illustration by Roberto Parada, in Mother Jones Magazine. I do love that illustration. It tells an important story. That the RGA had been forced to mobilize reinforcements in Kansas spoke to just how imperiled Brownback had become. After representing Kansas for nearly two decades in Congress, he had won the governorship in 2010 by a 30-point margin. Once in office, Brownback wasted no time implementing a radical agenda that blended his trademark social conservatism with the libertarian-tinged economic agenda favored by one of his most famous constituents, Charles Koch, whose family company is headquartered in Wichita and employs more than 3,500 people in the state. Other GOP governors elected in the tea party wave, such as Wisconsin’s Scott Walker, garnered more ink for their brash policy maneuvers, but in many ways Brownback had presided over the most sweeping transformation. Early in his tenure, he said he wanted to turn Kansas into a “real, live experiment” for right-wing policies. In some cases relying on proposals promoted by the Kansas Policy Institute—a conservative think tank that belongs to the Koch-backed State Policy Network and is chaired by a former top aide to Charles Koch—Brownback led the charge to privatize Medicaid, curb the power of teachers’ unions, and cull thousands from the welfare rolls. But his boldest move was a massive income tax cut. Brownback flew in Reagan tax cut guru Arthur Laffer to help sell the plan to lawmakers, with the state paying the father of supply-side economics $75,000 for three days of work. Brownback and his legislative allies ultimately wiped out the top rate of 6.45 percent, slashed the middle rate from 6.25 to 4.9 percent, and dropped the bottom tier from 3.5 to 3 percent. A subsequent bill set in motion future cuts, with the top rate declining to 3.9 percent by 2018 and falling incrementally from there. Brownback’s tax plan also absolved nearly 200,000 small business owners of their state income tax burdens. Among the “small” businesses that qualified were more than 20 Koch Industries LLCs. “Without question they’re the biggest beneficiaries of the tax cuts,” says University of Kansas political scientist Burdett Loomis. Income inequality, failure of trickle down economics, dramatic tax cut disasters, all come home to roost at some point. Kansans, it appears, are ready to change things. How about the rest of the nation? 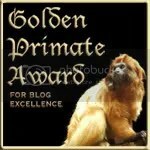 Brownback parody, or Brownback lunacy? Your flag is up. You’ve already read the Constitution and all 27 amendments. Time to pass on greetings to others: Happy Constitution Day! Eleven years after a small band of patriots declared the independence of our new Nation, our Framers set out to refine the promise of liberty and codify the principles of our Republic. Though the topics were contentious and the debate fierce, the delegates’ shared ideals and commitment to a more perfect Union yielded compromise. Signed on September 17, 1787, our Constitution enshrined — in parchment and in the heart of our young country — the foundation of justice, equality, dignity, and fairness, and became the cornerstone of the world’s oldest constitutional democracy. For more than two centuries, our founding charter has guided our progress and defined us as a people. 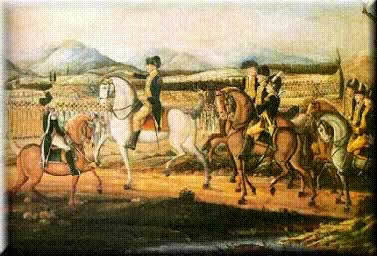 It has endured as a society of farmers and merchants advanced to form the most dynamic economy on earth; as a small army of militias grew to the finest military the world has ever known; and as a Nation of 13 original States expanded to 50, from sea to shining sea. Our Founders could not have foreseen the challenges our country has faced, but they crafted an extraordinary document. It allowed for protest and new ideas that would broaden democracy’s reach. And it stood the test of a civil war, after which it provided the framework to usher in a new birth of freedom through the 13th, 14th, and 15th Amendments. 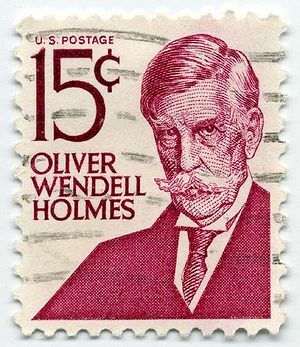 America’s revolutionary experiment in democracy has, from its first moments, been a beacon of hope and opportunity for people around the world, inspiring some to call for freedom in their own land and others to seek the blessings of liberty in ours. The United States has always been a nation of immigrants. We are strengthened by our diversity and united by our fidelity to a set of tenets. We know it is not only our bloodlines or an accident of birth that make us Americans. It is our firm belief that out of many we are one; that we are united by our convictions and our unalienable rights. Each year on Citizenship Day, we recognize our newest citizens whose journeys have been made possible by our founding documents and whose contributions have given meaning to our charter’s simple words. Our Constitution reflects the values we cherish as a people and the ideals we strive for as a society. It secures the privileges we enjoy as citizens, but also demands participation, responsibility, and service to our country and to one another. As we celebrate our Nation’s strong and durable framework, we are reminded that our work is never truly done. Let us renew our commitment to these sacred principles and resolve to advance their spirit in our time. NOW, THEREFORE, I, BARACK OBAMA, President of the United States of America, do hereby proclaim September 17, 2014, as Constitution Day and Citizenship Day, and September 17 through September 23, 2014, as Constitution Week. 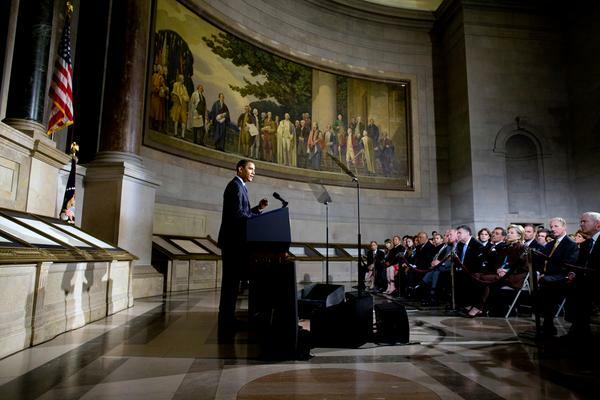 I encourage Federal, State, and local officials, as well as leaders of civic, social, and educational organizations, to conduct ceremonies and programs that bring together community members to reflect on the importance of active citizenship, recognize the enduring strength of our Constitution, and reaffirm our commitment to the rights and obligations of citizenship in this great Nation. IN WITNESS WHEREOF, I have hereunto set my hand this sixteenth day of September, in the year of our Lord two thousand fourteen, and of the Independence of the United States of America the two hundred and thirty-ninth. 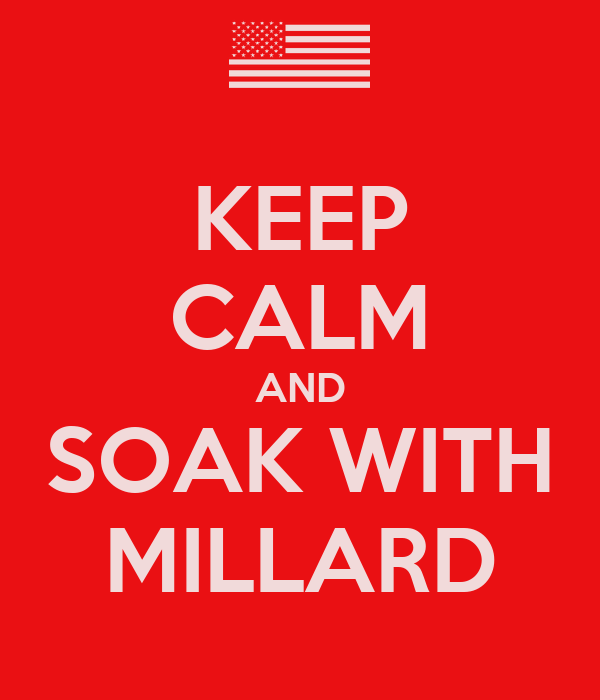 In that case, Happy Constitution Week!